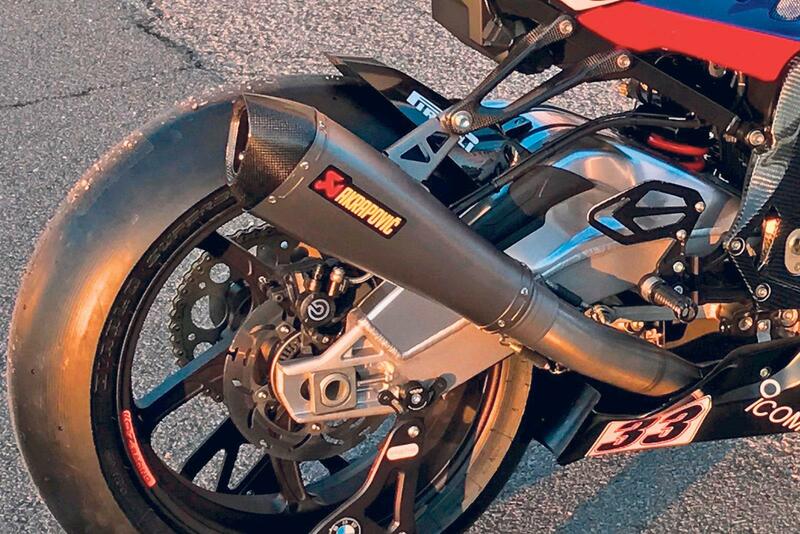 For this year’s racing season I’ve fitted this Akrapovic exhaust to my Prime Factors BMW S1000RR. It’s a stainless system with a titanium conical-shaped race can and carbon fibre end cap. The Slovenian company claim a 12.4bhp power hike over standard, but bolted on to my blueprinted superstock engine it helps it make 208bhp at the rear wheel on HM Racing’s dyno, together with a smooth, strong spread of power. Beautifully made, it’s 4.5kg lighter than the standard system, easy to fit and oozes full-factory specialness. It’s not cheap, but quality and performance like this comes at a price. It’s fruiter-sounding than previous Akrapovic systems I’ve tried, but it’s quite loud. Making 105dB on Thundersport’s noise meter it’ll just about scrape through a noisy trackday.